1st Gear: Gas prices continued to rise nationwide Friday, with the average price per gallon up nearly 28 cents in the past 10 days. The national average price for a gallon of regular gasoline rose to $3.471 on Friday, according to a daily survey by motorist group AAA. That's up 4.4 cents from $3.427 a gallon on Thursday and $3.368 on Monday. Any real reason why? Other than already-apparent supply disruptions, no, not really. Well, unless you count price speculation. 2nd Gear: Nick Fry, CEO of Mercedes' GP Petronas F1 Team unveiled this incredible View Suspended II display at Mercedes-Benz World, Surrey. 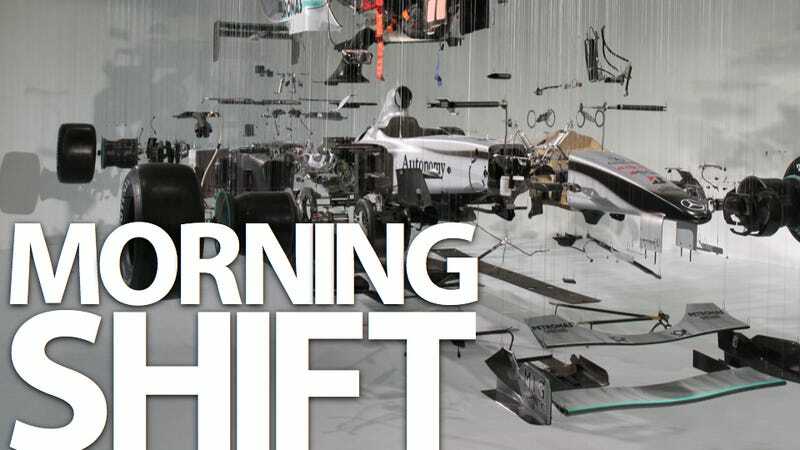 This captivating art exhibit deconstructs a Formula 1 car — all the way down to the littlest gasket, suspending it in mid-air for everyone to see. Want some high-res versions? They're on our Facebook page in a beautiful wallpaper-sized version. 4th Gear: Americans drove three trillion miles in 2010, the most vehicle miles traveled since 2007 and the third-highest ever recorded. The increase in traffic volume comes as the U.S. in 2009 posted its lowest number of traffic fatalities and injuries since 1950. Sounds like it's time for crotchety old man Ray LaHood to just give up on his anti-distraction legislation crusade, doesn't it? I certainly think so. 5th Gear: A Facebook "cause" account's been created aimed at convincing Mitsubishi to keep the Evo alive as a pure enthusiast vehicle. They have, as of this morning, less than 60 people who've signed on. This does not bode well. 6th Gear: This is the yellow sac spider that caused Mazda to recall tens of thousands of Mazda6s due to the potential for them to cause fiery death. I know the guys covered this already — I just still think it's funny.